These Entrepreneurs are Changing the World for ALL Entrepreneurs! On November 3rd the US House of Representatives passed, with almost unanimous bipartisan support, the Bill I’ve been working on HR2930, The Entrepreneur Access to Capital Act. It made headlines from the Wall Street Journal to USA Today. This started less than a year ago when I was out trying to raise capital for a startup idea I had; using smartphones to do instant polling. The idea won the November, 2010 Miami Startup Weekend Challenge. I went out to raise capital but hit the same barrier as most entrepreneurs. There’s no capital. Banks aren’t lending, home equity lines aren’t an option because of fallen home prices, credit card limits were lowered and interest rates skyrocketed, and private money is only for a select few. Entrepreneurs, ideas, capital, businesses and JOBS – They are all interconnected. Without capital small businesses cannot innovate and hire. The key to getting us out of this recession is to get American’s back to work and this requires job-creating businesses. So rather than bemoan the problem my peers and I went out to solve it. We decided, given the advances in accountability and transparency due to the Internet and technology, the time was right to update 80-year old security laws so that we could go to our friends, family and community and sell them shares in our businesses via crowdfunding. (This is currently illegal). I testified at 2 congressional hearings; Testimony one and Testimony two. 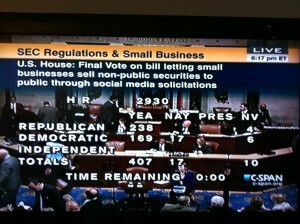 We are the force & framework behind HR 2930, the Entrepreneur Access to Capital Act! Our bill was almost unanimously approved by a vote of 407 to 17 on the floor of the US House! But we aren’t done yet. Even though we had such bipartisan support, we we need to keep the pressure on. Hence, we are taking our fight to the Senate. We are holding a HUGE rally on November 17th in Washington, DC to coincide with Global Entrepreneurship Week and an annual, one-day meeting the SEC is having on Small Business Capital formation. Our goal is to introduce Washington to ‘Joe the Entrepreneur’ and ‘Jill the Innovator,’ explain how they are the job-producing engine of the USA and have a teach-in with our Senators about Crowdfund Investing. Our solution allows the community to pick and finance only those companies they think are worthy. They will back them not only with money, but also with knowledge, experience and marketing power. But in order to pull this rally off, we are trying to crowdfund the cost. So feel free to check out our Indiegogo campaign. Feel free to give a buck or two if you’d like. Contact your senator (here) and tell them to introduce and support HR2930. Ask them NOT to play politics with the Bill and attach frivolous amendments that don’t pertain to the bill. Feel free to come to the rally on November 17th and most importantly, feel free to share what we’re doing with those that you think would find it interesting! Video here. Forward to 9 minute and 25 second part to begin segment. SUSIE GHARIB: Another source of funding for small businesses is crowd funding. It’s a way for startups to use the Internet to raise relatively small contributions from a large number of people. The only problem is that securities’ regulations severely limit the ability to crowd fund. But as Darren Gersh reports, Congress is on the way to changing that. DARREN GERSH, NIGHTLY BUSINESS REPORT CORRESPONDENT: Find a friend with extra bars of gold in the basement — that’s the traditional way entrepreneurs fund a business. But for those who don’t have a rich uncle, there is what’s called crowd funding. 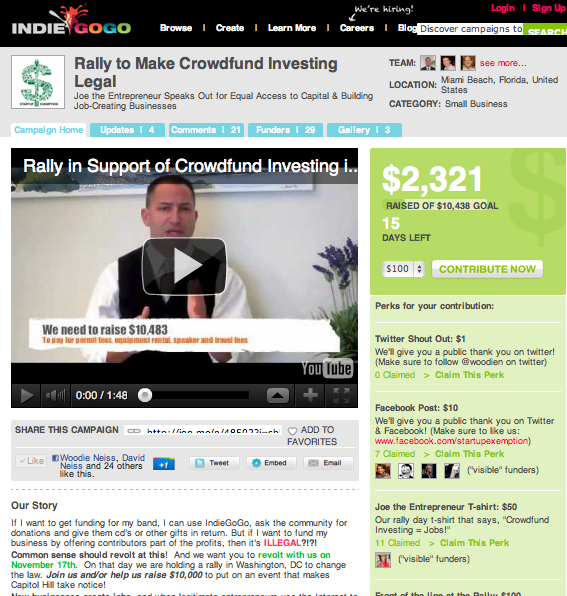 Crowd funding is a strategy to raise small sums of money from many people, even people all over the country. JASON BEST, CO-FOUNDER, STARTUPEXEMPTION.COM: It really democratizes the ability to raise funds for your business. GERSH: Jason Best is lobbying Congress to pass legislation making it legal to crowd fund. The bill he backs allows entrepreneurs to raise up to $1 million, $2 million if companies provide audited financial statements. Entrepreneurs would not have to go through the expensive process of registering their shares with the Securities and Exchange Commission or state regulators. In a given year, investors can pitch in a total of up to $10,000 or 10 percent of adjusted gross income, whichever is smaller. BEST: This is an opportunity for entrepreneurs and small business people, whether they are in Arnold, Nebraska, Detroit, Michigan or Miami, Florida, to be able to raise capital for their ideas and to build their businesses. GERSH: To combat the kind of fraud that brought down Enron, Congress has tightened accounting rules, making it harder for companies to go public. Entrepreneurs like Idealab’s Bill Gross say crowd funding will provide cash before venture capital and the chance at an initial public offering comes along. BILL GROSS, CEO IDEALAB: At this first stage, when a company is just getting going, this could be a big boost to getting a company to go from, say 10 people or five people to 50 people and to first revenues or even first profits. And I think that’s going to be really helpful to the economy. GERSH: But state securities regulators like Heath Abshure say crowd funding will lead to crowd fraud. HEATH ABSHURE, ARKANSAS SECURITIES COMMISSIONER: The fact is, it is a wide open gate that a lot of folks can run through and some of those folks, we don’t want them running through the gate. GERSH: But supporters say the Internet will help police the crowd. BEST: Anything that happens is posted to the web almost in real time. Anything that goes wrong or right is posted to the web in almost real time. And so, the crowd will be a great enforcement tool, along with regulators at the state and Federal level. GERSH: The idea of crowd funding is attracting an unusual crowd in Washington. The president, House Republicans and House Democrats are all on board. Now, the idea just needs to find a backer in the Senate. Darren Gersh, NIGHTLY BUSINESS REPORT, Washington. Our IndieGoGo Campaign – Hey U.S. Senate, We’re Coming to Talk to YOU! BREAKING NEWS …. 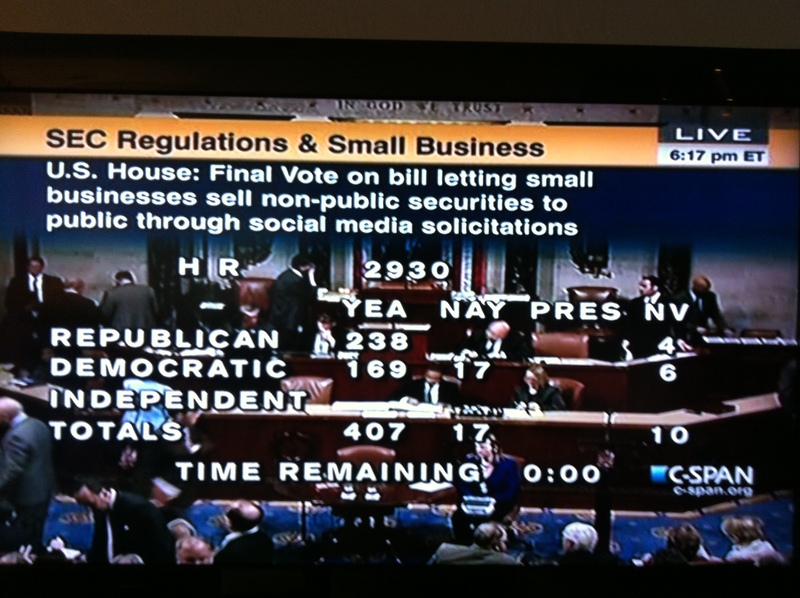 Our Bill, HR 2930 passes with almost unanimous, rare bipartisan support! This is a HUGE achievement for every struggling entrepreneur and innovator out there that is looking for capital! BUT we aren’t done yet! “If and when” the Senate picks this up IS YET TO BE DECIDED?!?! So help is fund and hold our RALLY IN WASHINGTON,DC on November 17th to keep the positive momentum going! This coincides perfectly with Global Entrepreneurship Week and a one-day meeting the SEC is having that day on Small Business Capital Formation. OUR FACES NEED TO BE SEEN AND OUR VOICES HEARD! We’ve launched a campaign on Indiegogo to help fund the rally and WE NEED YOUR support! So please contribute! And if you are in or near Washington on November 17th, Please COME TO THE RALLY! 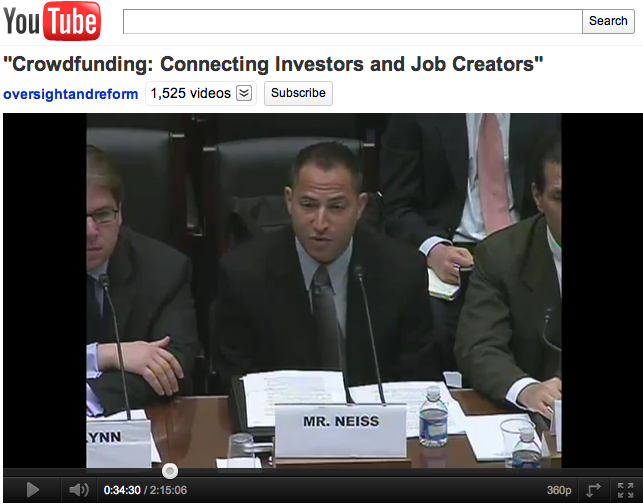 US House Votes in Favor of Crowdfund Investing! One word …. AMAZING! The debate was amazing and the vote was AWESOME – 407 to 17! I can’t believe in only 9 short months we went from “hey we’ve got a framework and a solution” to a bill that just passed the US House of Representatives! 1) Karen Kerrigan at the Small Business & Entrepreneurship Council, for listening to me and putting up with my nonsense! 3) Angus Loten at the Wall Street Journal for deciding the subject was newsworthy enough in our early days to write about it in the WSJ?!?! 4) Kevin Lawton who wrote The Crowdfunding Revolution and provided major contributions to my testimonies and the Startup Exemption framework. 5) Paul Spinrad, Jenny Kassan & Danae Ringelmann (of IndieGoGo) who wrote the first petition to the SEC to make equity-based crowdfunding legal. Paul also provided incredible input in the testimonies and framework. 6) Chairman Darrell Issa who so graciously took 20 minutes after the May hearing to talk one-on-one with me about crowdfunding as a solution. Peter Haller & Hudson Hollister for pushing the idea forward. 7) Doug Rand from the White House who reached out to us and included our proposal as part of the President’s Jobs Act. That’s bipartisan support! 8) And the AMAZING Chairman Patrick McHenry for calling the Crowdfunding hearing, writing the legislation, entering it into record, deliberating over TWO committee hearings, bringing together ideas from both sides, passionately debating it on the floor today and pulling off a 96% bipartisan win in the US House of Representatives!!! Also a shout out to Dana Mauriello for her awesome testimony at the September Crowdfunding hearing! WE AREN’T DONE! … Off to the SENATE … Stay tuned because we have our own big news on this front coming out in the next 24 hours!! House approves bipartisan SEC bills; GOP, Dems still bicker – The Hill’s Floor Action. President Obama Endorses Our Framework and HR 2930! When we crafted our framework for Crowdfund Investing in February, 2011 we thought we had a .1% chance of updating the security laws to make equity-based crowdfunding legal. Now we have HR 2930, the Entrepreneurial Access to Capital Act whose roots come from 2 hearing we’ve had on Capitol Hill and our entire framework! And this just in from the White House … aaaaaaaah … day by day we get closer to helping entrepreneurs get access to capital to innovate and create jobs! A TON of thanks for Rep. Patrick McHenry for taking on our cause!! Major backers of our bill: US Chamber of Commerce, National Taxpayer Union, Small Business & Entrepreneurship Council (SBE Council). Add your support! Yesterday, October 27, 20011, our bill HR 2930 was amended in the Full Financial Services Committee. It now pretty much matches everything we have been advocating for in Washington! From here it goes to the floor of the US House of Representatives. The Startup Exemption formulated only 10 months ago with a goal to update the security laws to use the tenants of crowdfunding to get capital flowing to entrepreneurs. In that short period of time, they acquired thousands of follows on their petition, blog and twitter feed. They were part of 2 congressional hearing in Washington, DC. They were consulted and included in President Obama’s American Jobs Act and were the backbone for HR 2930, what they like to call the Crowdfund Investing Act. 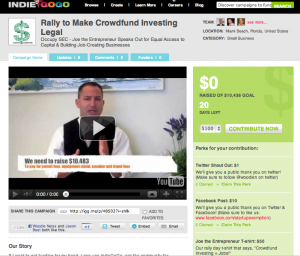 There has been a lot of progress to date in our effort to make Crowdfund Investing (CFI) legal. The proponents, including the President who included our framework in the American Jobs Act as well as leading Republicans on the Hill who introduced HR 2930, otherwise known as the Crowdfund Investing Act, get it. Capital is hard to come by. Wall St isn’t focused on entrepreneurs. The banks aren’t lending and private money is only for a select few. 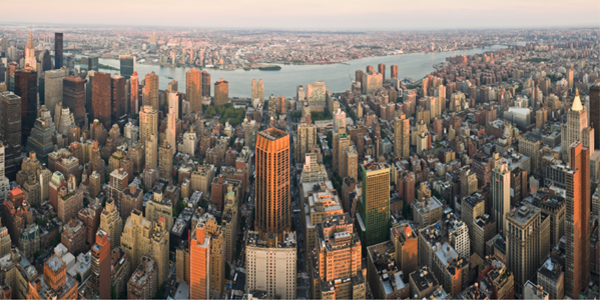 Since donation-based crowdfunding is working, let’s apply those tenants to equity-based crowdfunding and get capital flowing to entrepreneurs; also known as our nation’s net job creators. The model we propose is itself, a self-vetting mechanism that utilizes the Internet, and the wisdom of crowds to help mitigate risk for investors. CFI isn’t free money. In a time of recession folks are even more cautious about their money and no one is going to look at this as a way to make a quick buck, entrepreneur, investor or crook. The crowd is more skeptical than ever before. And only those entrepreneurs that are transparent and accountable will be successful in raising capital, forming businesses and hiring Americans. However the naysayers are surfacing. A number of them can be dismissed because they do not want another competitor in the capital markets. (Our response to them is, step up to the plate and fund our nation’s entrepreneurs at the same degree or better than prior to the financial meltdown). Another group are just naysayers with no solution, just vague fear mongering with little data. And the final group is the conspiracy theorists that believe (with no hard data) it will open the floodgates to fraud. We adamantly refute this. Submit to a background/fraud check (name, address, social security and date of birth) to ensure he hasn’t committed fraud. He would have to pitch his idea on SEC-registered Crowdfund Investing platforms. These platforms will be required to perform the fraud checks and contain an investor education component. Investor education and terms of service will warn investors to only invest in people they know, products or services they believe in, entrepreneurs whom they can talk to about the idea and only those ideas that have the greatest number of 1st degree connections. eg: You can feel confident backing an entrepreneur with 89% first degree (meaning they know him personally) investors that represent at least 89% of the committed capital. However, you should be skeptical of an entrepreneur that only has 24% first-degree backers and they have only ponied up 10% of the amount needed. All of this is easily tracked and graphically displayed with standard web tools. The platforms will enable open dialog where potential investors can pick apart the idea, the entrepreneur’s experience, the business model and the amount of equity offered. The entrepreneur will have to respond to each of the comments to the satisfaction of the crowd. The crowd will vote on the answers by using the “like” button. A higher number of likes the more confidence investors will have again. If an entrepreneur doesn’t answer the questions to the satisfaction of the crowd he/she won’t be funded, period. Again all of this can be tracked and graphically displayed for potential investors to see. Our proposal is an all or nothing financing window. If a fraudster is trying to bilk people out of $1M and he hits a funding target of $999,999.00 he won’t be funded and no money will be exchanged. Anyone who is trying to raise capital will have to set small milestones and raise smaller amounts of capital, hit their milestones and go back for more with proof that they’ve achieved what they said they were going to do. Of course, they will have to be transparent and communicate with their investors or again they won’t have the confidence going forward to raise additional money. Another trigger will be the percent of 1st round investors that come back for a second round. The higher that percent the more confidence. The lower, the less likely they will raise additional funds. So still think fraud can take place with all these triggers? If so, give us the example and let’s work it thru the model. ps – Remember, this exemption is not be available to foreign issuers, investment companies, and public companies. A solution is gaining steam to help spur small-business growth and the anemic state of job creation. It requires updating Securities and Exchange Commission (SEC) regulations regarding general solicitation and accreditation so average Americans can choose to invest in small businesses. Crowd-fund investing is a common-sense solution that has attracted the interest and support of President Obama. Republican Rep. Patrick T. McHenry of North Carolina recently introduced H.R. 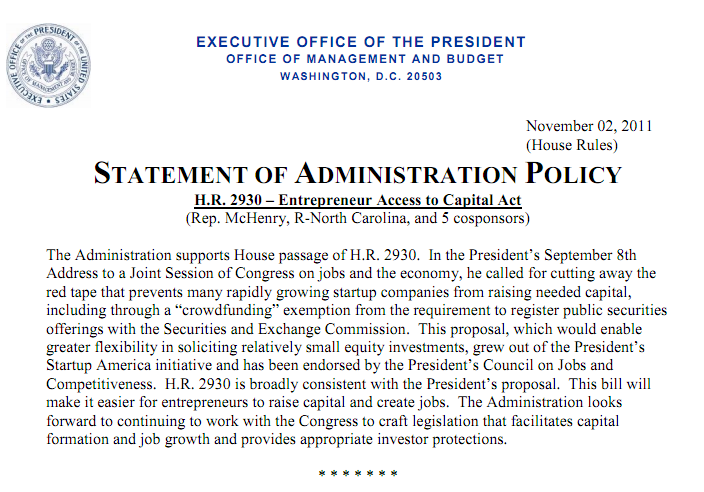 2930, the Entrepreneur Access to Capital Act, legislation that aligns with the general framework supported by the president. So here we have a common-ground idea over which both sides of the political aisle agree on many key details. It’s time to move forward quickly so crowd-fund investing can help capital-starved businesses and our gasping economy. Nascent entrepreneurs and growth-oriented firms continue to have a difficult time finding capital to expand and innovate. Of course, our nation has counted on the job-creating prowess of small businesses to lead us out of difficult economic periods. This time around, unfortunately, the uncertainties have become too great. New startups, which have fueled job creation following previous recessions, have not taken root at the same pace as in the past. Weak demand, tight capital and credit markets, and policy uncertainties continue to erode confidence and entrepreneurial activity. The crowd-funding solution addresses a key concern that would help entrepreneurs identify new sources of capital, thus providing optimism and much-needed resources for investment and growth. America, the land of opportunity, is being out-innovated. Other places, such as the United Kingdom and France, with similar capital constraints have already made crowd-fund investing legal. The crowd is vetting the ideas of entrepreneurs and backing only those they deem worthy. Fraud – a key issue of concern for regulators and legislators alike – hasn’t reared its wicked head, thanks to hundreds if not thousands of prospective investors picking apart the idea, the business model or the execution plan of the entrepreneur for bringing his goods or services to market. These discussions and vetting occur in open dialogues on Internet platforms. While not allowable under existing U.S. securities laws, crowd-fund investing can provide a way for micro-angel investors, both accredited and unaccredited, to pool their individual small investments to support entrepreneurs and enterprises that have merit. If changes are made in U.S. laws, the funding rounds can occur via SEC-regulated websites. These websites will provide transparency, open communication, accountability and reporting among the investors, entrepreneurs and theSEC. This is an expanded version of “friends and family” fundraising, which uses an individual’s or business owner’s social networks to create jobs and grow the economy. Mr. McHenry’s bill would provide a crowd-funding exemption to SECregistration requirements for firms raising up to $5 million, with individual investments limited to $10,000 or 10 percent of an investor’s income. The exemption would erase limits on the number of investors until the first $5 million of capital is raised. This exemption provides smaller investors an opportunity to support startups, which currently is not an option under SEC regulation. In my recent testimony before the House Committee on Oversight and Government Reform subcommittee that Mr. McHenry chairs, I noted some other key provisions that may be considered to address fraud and accountability concerns. For example, there could be a requirement that investors take a brief online course about crowd-fund investing and review a series of disclosures that demonstrate they are familiar with the basics of investing and understand the risks. In addition, general solicitation should be allowed only on registered Internet platforms where entrepreneurs and investors can meet and the crowd can vet in an open and transparent manner. Standards-based reporting would be submitted to the SEC by small businesses using the platform. A project would not get funded until it met its minimum target. It would be an all-or-nothing proposition. Only if the target was reached would money be withdrawn from donor accounts. The proposed reforms to existing law are modest and follow the spirit of the Securities Act of 1933 and the Exchange Act of 1934. The modifications include anti-fraud safeguards and create a peer-to-peer system in which communities become the de facto seed and early-stage funders to entrepreneurs. There is wisdom in crowds. They are massively diverse and have a better collective intelligence. Every investor contributes to the crowd’s knowledge. An interconnected, knowledgeable crowd brings more experience. Together they will fund ideas that help small businesses – and the investors themselves – succeed. A crowd-funding model, of sorts, has been taking place successfully online for the past five years. The current model allows a group of people to pool their money and “donate” it to fund an idea. More than $300 million has been donated to more than 500,000 artists, musicians and developing world entrepreneurs. Imagine what could be accomplished if investment dollars were devoted to promising U.S. entrepreneurs whose ideas only need the capital to launch into the marketplace? Now it’s time to take action. Americans need to be allowed to do what they do best: come together as one to out-innovate, outproduce and outwork the rest of the world. The only question: How long will it take for our government to let us? Sherwood Neiss, an entrepreneur, is founder of Startup Exemption and a member of the Small Business and Entrepreneurship Council.